Wrestling draws the biggest crowds during the annual Nadaam celebration of the traditional "three manly sports." 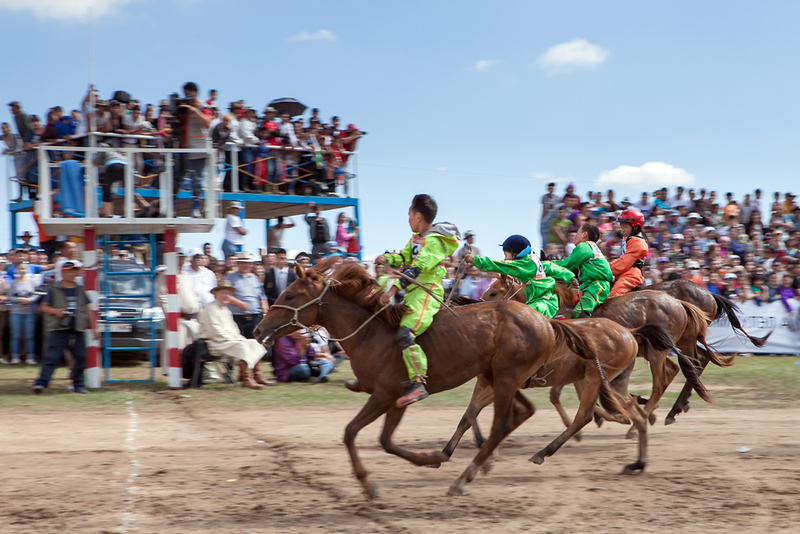 Four young riders race for the finish line in the 15-kilometer race for 2-year-old horses. The ceremonial "Nine White Banners," which date back to the time of Genghis Khan, are displayed in the national stadium. 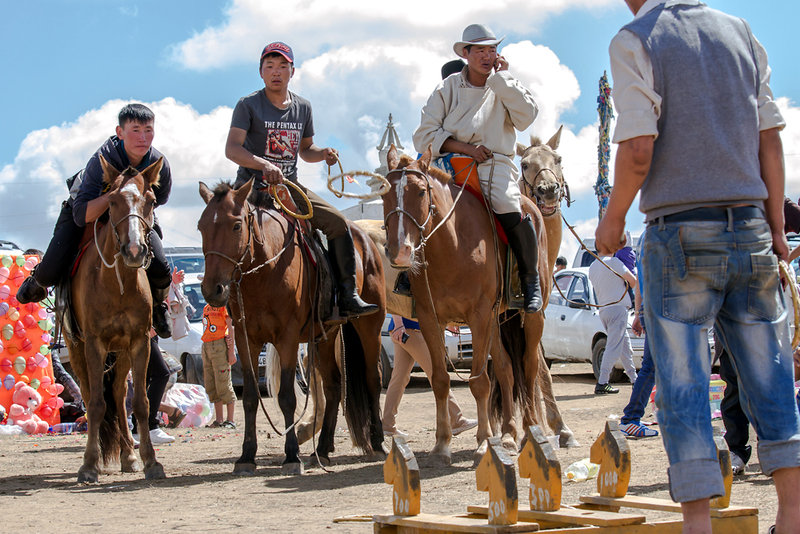 An audience watches as competitors of "shagai" try to dislodge tiny targets of sheep or goat anklebones five meters away. 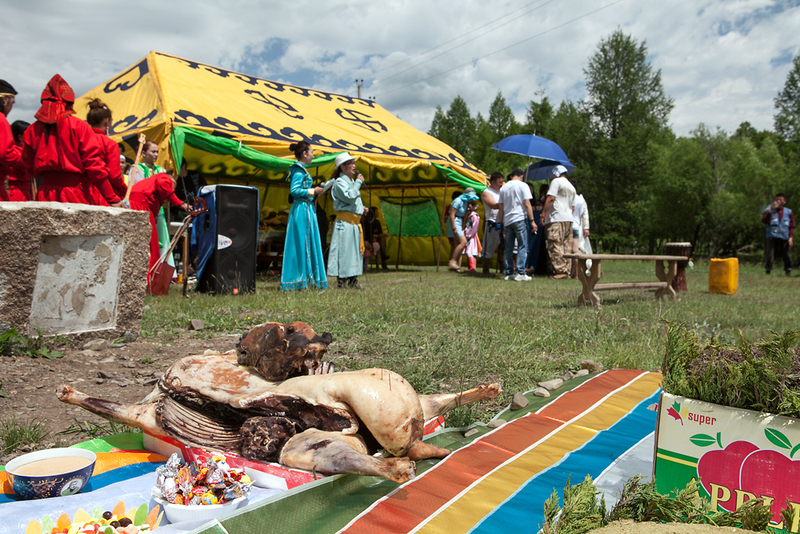 A steamed goat is laid out to ancestors at a smaller Nadaam set up by a group of shamans near Ulaanbaatar. 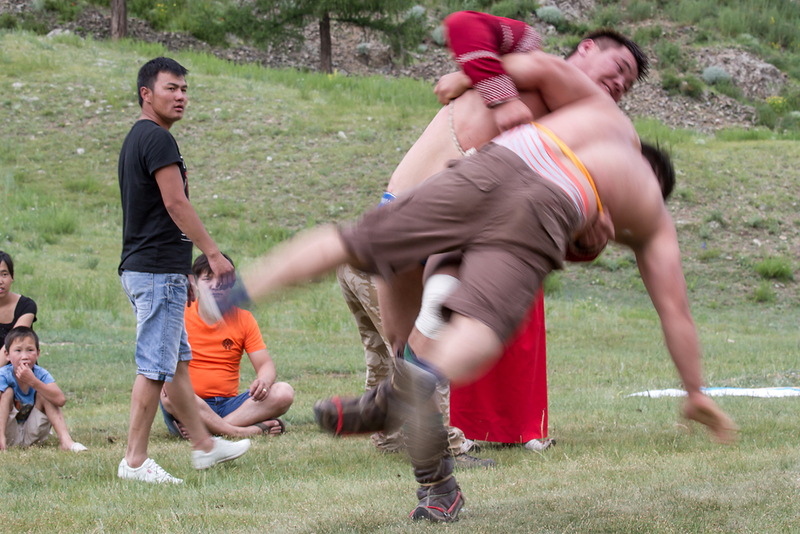 Deft legwork is key to win a Mongolian wrestling match, where the winner is the first to thrown his opponent to the ground. Female archers await their turn in one of two sporting events open to women during Nadaam. Wrestlers are considered heroes, and children dress up in wrestling costumes as they accompany their parents to the games. 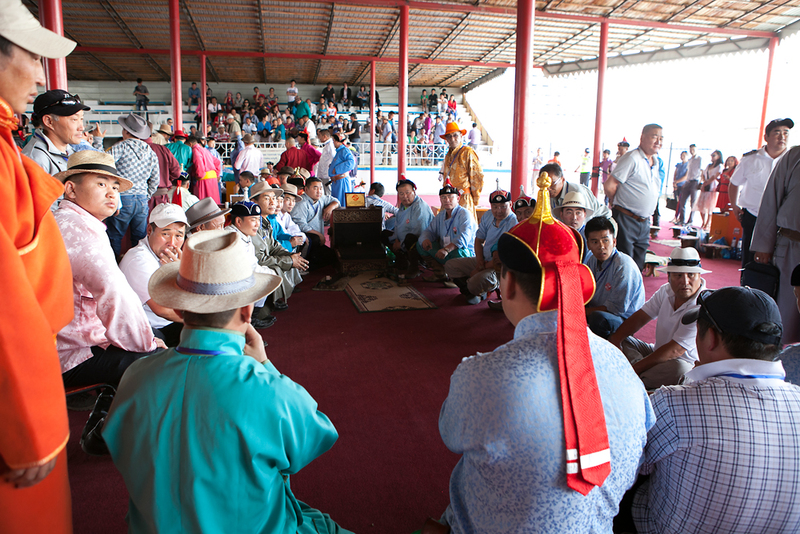 Herders visiting the Nadaam horse-racing grounds try their luck at one of the many game stands set up by local vendors. 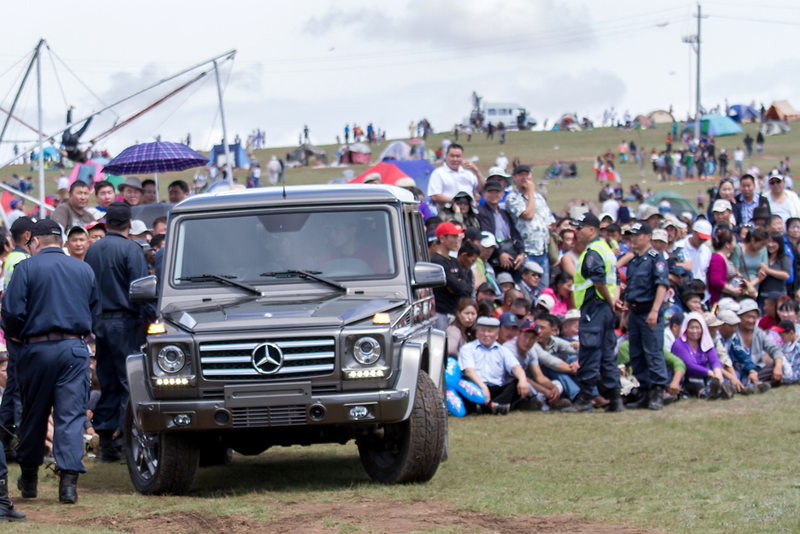 A Mercedes Benz G500 SUV, one of the prizes awarded to the national wrestling champion this year, is paraded to onlookers. "Shagai," or knucklebone shooting, was introduced to Nadaam in 2001 as a fourth addition to the three manly sports. A judge rides with the winner of the 15-kilometer race for 2-year-old horses across the finish line. Male archers warm up for the first round of the men's national archery tournament. 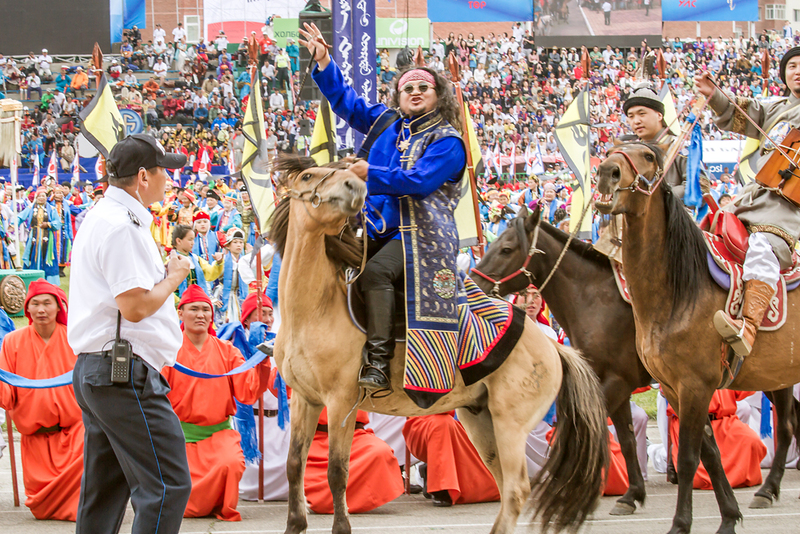 Mongolian rock star Lkhagvasuren, frontman of hard rock band Haranga, sings on horseback during the Nadaam opening ceremony. Many small villages, towns, and organizations host small Nadaam events across the country during the month of July. 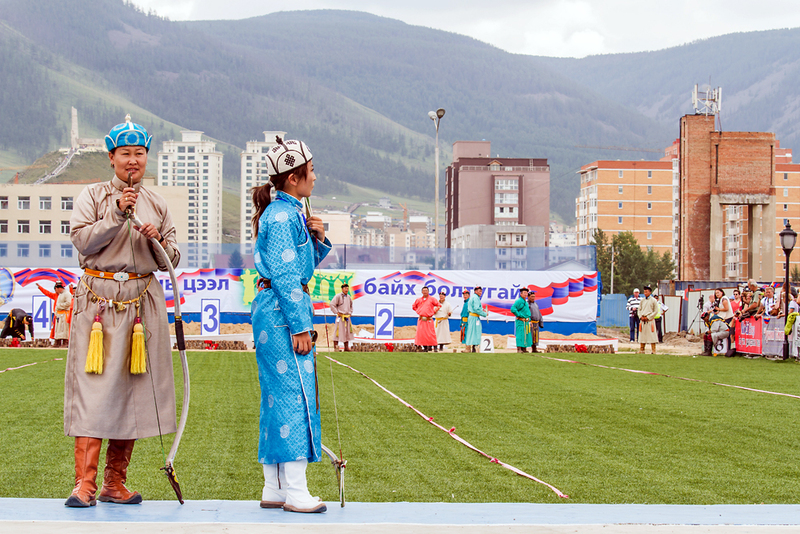 Mongolian President Tsakhiagiin Elbegdorj congratulates winners of the national archery competition. 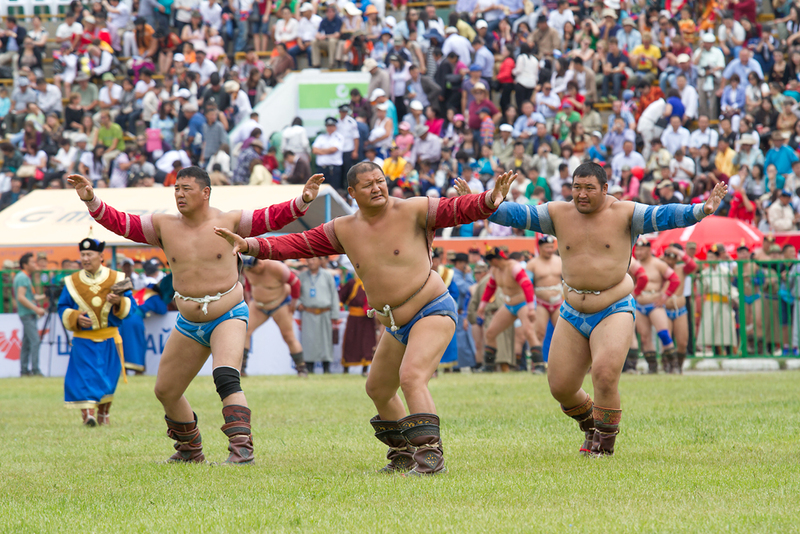 Every year in July Mongolians mark Nadaam, the national festival featuring what locals call “eriin gurvan nadaam,” or the “three manly sports” of wrestling, horseracing and archery. 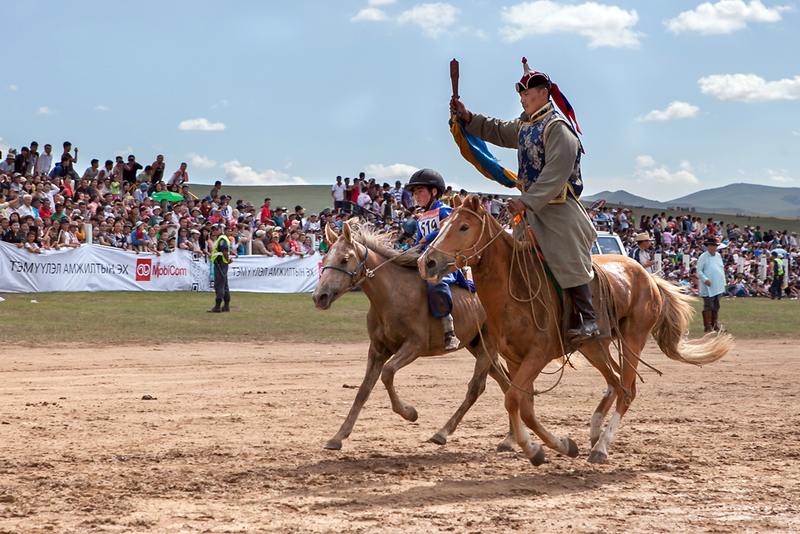 The festival dates back to the times of Genghis Khan, who supposedly introduced the competition as a means to keep his soldiers in fighting form during times of peace. This year’s national Nadaam festival was dedicated to what Mongolians claim as the 2,222nd year of Mongolia’s statehood. Provinces and small towns across the country host their own Nadaam games throughout the month. 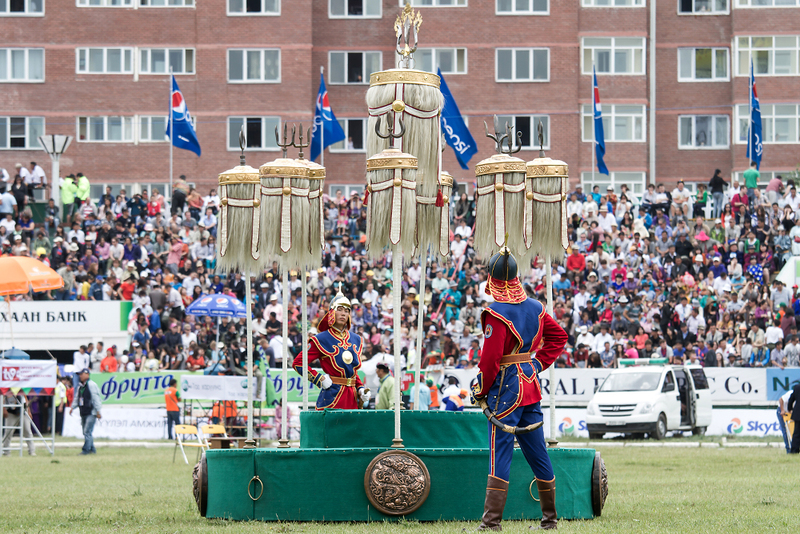 The nationwide festival takes place in the capital Ulaanbaatar. 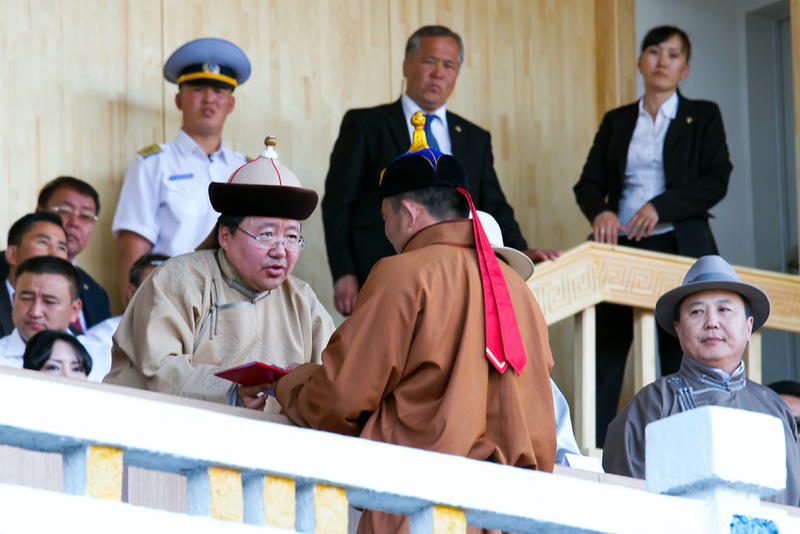 The games are officially declared open after nine ceremonial white banners representing the nine tribes of Mongolia are brought from the government house and hoisted in the national stadium. Wrestling and horseracing still draw the biggest crowds, but participation in archery remains strong. 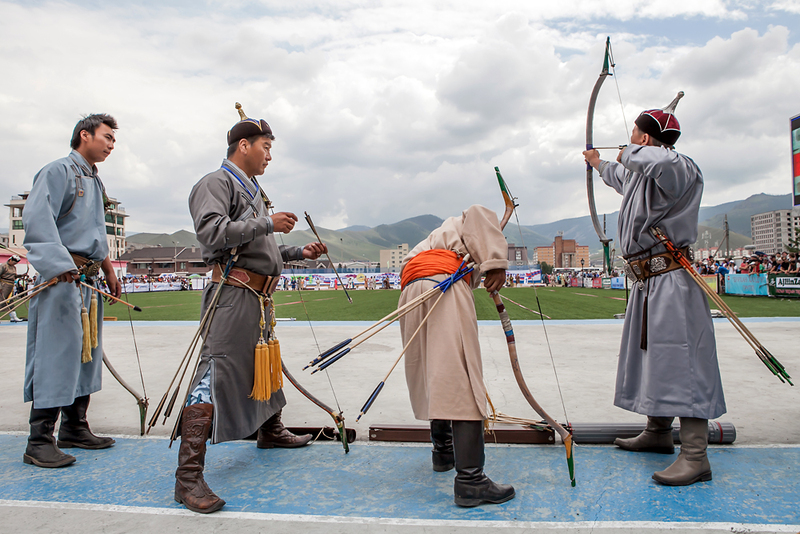 In 2001, a fourth traditional sport of knucklebone shooting or “shagai” was included in the Nadaam games. 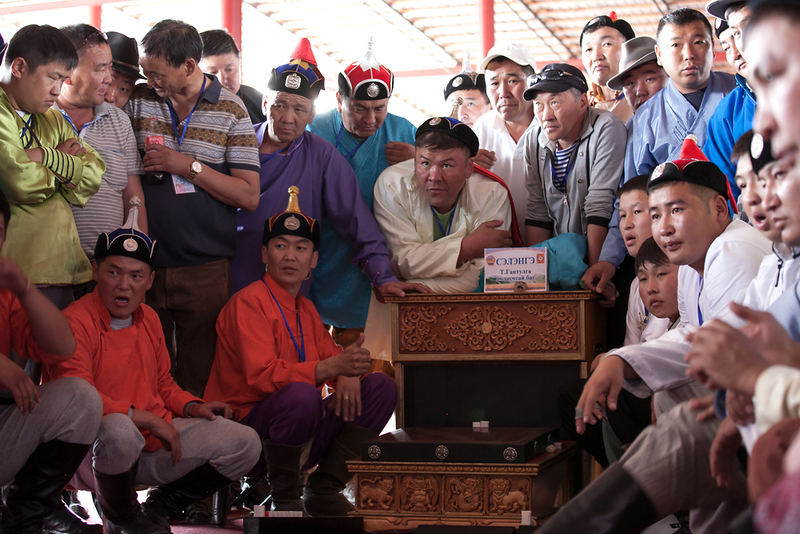 Shagai contestants compete to strike small targets made from goat or sheep anklebones with a striker made from polished knucklebones and flicked with the fingers through air from a distance of about five meters. Women participate only in archery, and young girls can be jockeys in the horseraces but are not allowed in wrestling or shagai. While the games have changed little over the years, the prize money keeps growing, along with the number of corporate sponsors. The winner of the national wrestling champion, for example, walked away with a Mercedes Benz G500 SUV, keys to a two-bedroom apartment in Ulaanbaatar’s posh residential district of Zaisan and a cash prize of 15 million tugriks (about $10,000).